T-Mobile has offered several neat T-Mo-branded gifts through T-Mobile Tuesdays, including a water bottle, a travel mug, and a reusable bag. Next week will bring another T-Mo-branded goodie. On Tuesday, October 23rd, T-Mobile customers can get a free T-Mobile Halloween bucket, just in time for trick-or-treating. 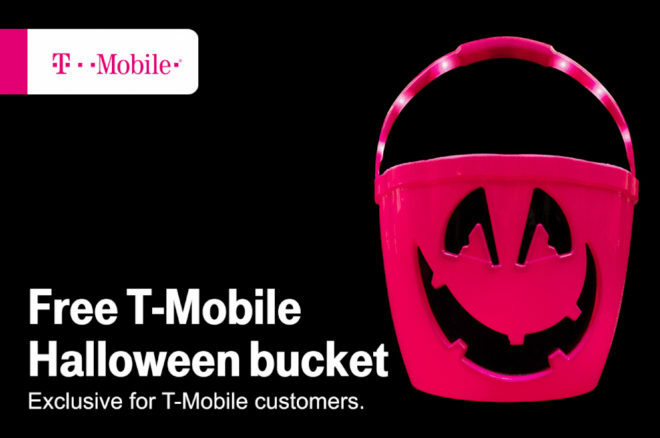 The image shared by T-Mobile shows that the bucket has a happy Jack-o’-lantern face and the handle appears to light up, too. Also coming next week is an Auntie Anne’s pretzel deal and a discount of $0.25 off a gallon of gas at Shell. Next week’s grand prize winner will get a year’s worth of movie tickets from Atom Tickets. Specifically, the winner will receive an Atom Tickets account credit equal to eight standard movie tickets (up to $15) per month for 12 months. The grand prize also includes a check for $617 to use for taxes or other expenses. Pretzels & discount gas sounds great also. Still waiting for that Vudu credit…. At this point I’m guessing Vudu is gone for good as it’s been forever since we’ve had it. Good for kids. Glad to see fuel again. Those of us that don’t use Google Play would never use that. Vudu is supported by both iOS and Android.